(1/4/19) Update: Recently there have been several of the links I’ve been sharing that have inexplicably died. I have re-uploaded the files to fix the problem. However, this means they have new links, so I have also had to update the link list, and that old copies of the list will have broken links. I hope this does not continue to be an issue. However, I will keep a running log of the last three characters of the old and new links here, so you can check if your info is up to date. If your info is not current, simply re-download a fresh copy of the list using all the same steps below. And if you run into a link that fails with a “Temporary Error” message, and you aren’t over your mega data limit, please post in this thread so I can address the issue. Sorry for the inconvenience. That said, if this is your first time downloading the NJVC Custom Blu-ray Set, this update will only concern you if you run into new dead links. Otherwise, you may disregard this update as you follow the steps below. Great news! I got the OK from NJVC to share his sets on mega again! Harmy has given his approval as well. More great news! With help from another member, I have also obtained the alternate version of this set that uses ten BD-R 25 discs instead of four BD-R 50s and two BD-R 25s. And I have the green light from both Harmy and NJVC to share these variants as well! The content of this version of the set is almost exactly the same as the one I have already been sharing here for several months. It merely divides the material of the larger discs between two smaller ones and has a few less audio options. Since I am now sharing all the versions available, and there will be several instances where you will have different choices for how you would prefer your content be divided, I am including the chart below to hopefully help make the options a little clearer. This image is just here as a preview. Click the link beneath it for the full size graph. Also, just so you know, downloading a given disc does not mean you must continue with only discs in that version. These are just choices to mix and match how ever you would like. If you would like more information on these sets and previews of them, go to the NJVC Custom Bluray Set thread. But as with anything else Despecialized, these projects should never be bought or sold. You are also required to own an own official copies of the Blu-rays or the HD Digital Downloads of Episodes IV, V, and VI before you download anything. These requirements are to allay concerns of piracy, which could threaten the entire Despecilaized Project. So before you download anything here, please obtain official copies of the Original Trilogy in HD. And please … please … DO NOT BUY OR SELL THESE! I also have a guide to burning these sets posted here below in the most comprehensive way I could think of. Mods, if you spot something anywhere in this guide that I could improve, please let me know. 1) If you do not already have a proboards.com account, go to https://login.proboards.com/register/6838057 and set one up. 2) Now go to http://swesbrotjbrmls.freeforums.net/. Your proboard credentials should allow you access. 4) Click the “NJVC” Subject. This will contain two links. One will say “BD-R 50/25 rars”. The other will say “BD-R 25 only rars”. 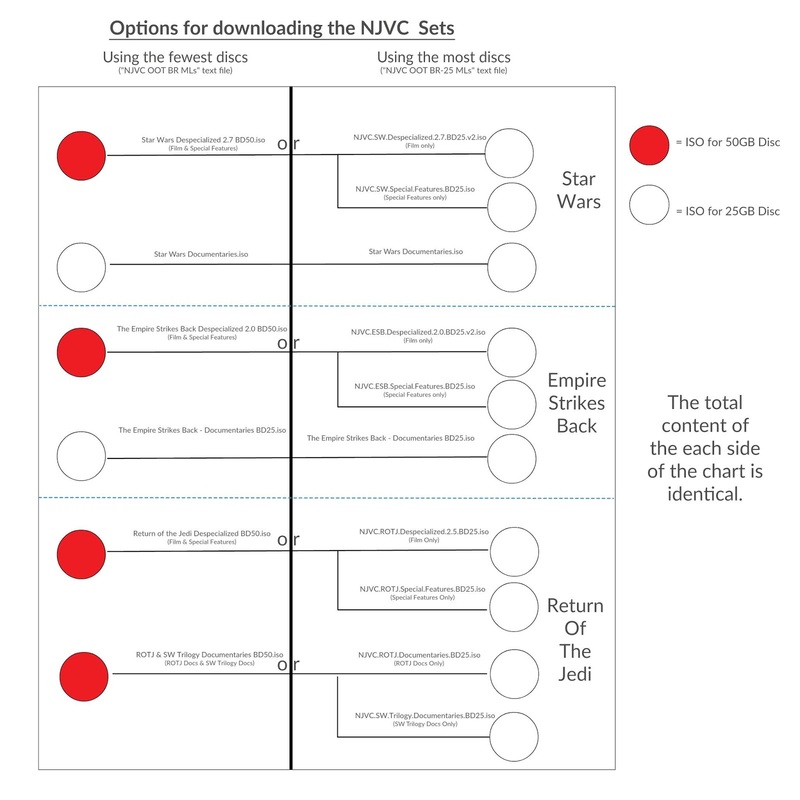 Using the chart above, you can decide whether you want the information for one version or the other, or both if you want to obtain a custom combination of discs from both sides. 5) Those links will each direct to a download link for a password protected rar file. For the “BD-R 50/25 rars” option, the file will be called “NJVC OOT BR MLs”. For the “BD-R 25 only rars” option, the file will be called “NJVC OOT BR-25 MLs”. The download page for either will probably say “Whoops! There was a problem with the preview.” This is merely because the files are password protected. You will use the password I will give you in the next step to extract either of the files you have chosen. 6) Download and extract either file with the password “Speci@lEditionsAre2ShortSighted”. The extracted package will contain a single text file called either “NJVC OOT BR MLs” or “NJVC OOT BR-25 MLs”. The folder links are only provided in case you would like to import them to your own mega.nz account before downloading. It’s not feasible to download the entire folder all at once without a premium account. For your actual download, you will need to use the lists of links beneath the “File Links” Headings. These are download links to all the necessary rar files. Each of these rar files is a piece of the finished ISO disc image, which has been spliced into smaller pieces for the purpose of making them more transferable. You will need to finish downloading all the rars in a given group before you can extract anything, since any of the rars in a given section are only part of the finished file. All these links are in free accounts, and unless you have a paid account, mega.nz will impose a 5GB download limit every six hours. You should also be aware that the files in the sections with two folders are in bigger pieces. before getting a messages telling you to wait several hours before continuing to download if you are downloading through a browser or getting an error message in a download manager program. Also, if there is ever a “rush” on these files that slows them down because of bandwidth demands, there isn’t anything I can do. 8) For this reason, I recommend using the download manager “FreeRapid Downloader”. It will let you download several files at once, as well as saving your progress if the process is aborted midway through with the wait message. You can get that at this link: FreeRapid Downloader. But you will still likely be limited to 10 or 5 rar files every six hours or so. Remember, patience is key. 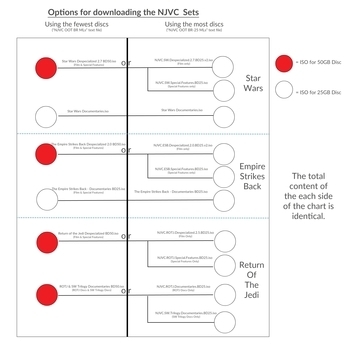 For more details on using FreeRapid Downloader, check out Section 4, Steps 1-6 of “The Ultimate Introductory Guide to Harmy’s Star Wars Trilogy Despecialized Editions”, found here. 9) Once you have all the rar files from a set downloaded into a single folder, extract them with your chosen unarchiving software. 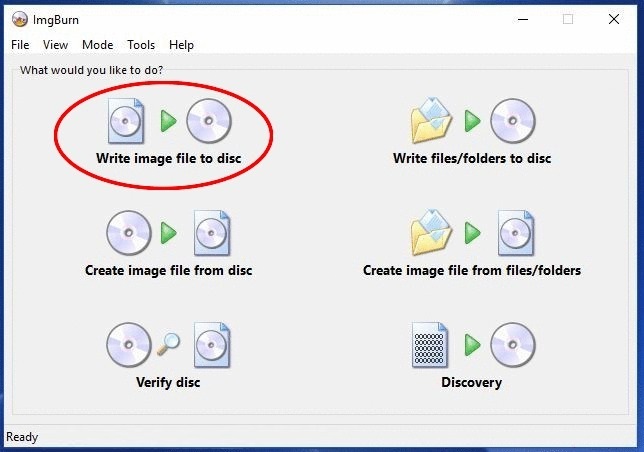 Do this by opening your chosen program, selecting the the directory in which you want the finished ISO to save, selecting part 1 of the rar set, and then starting the extraction process. Your computer will recognize that it is part of a set and automatically extract all the rars. It will also reassemble them into the finished ISO file and save that to whatever location you choose. 10) Once the extraction process is complete for each of the rar sets, you will have several ISO Files. 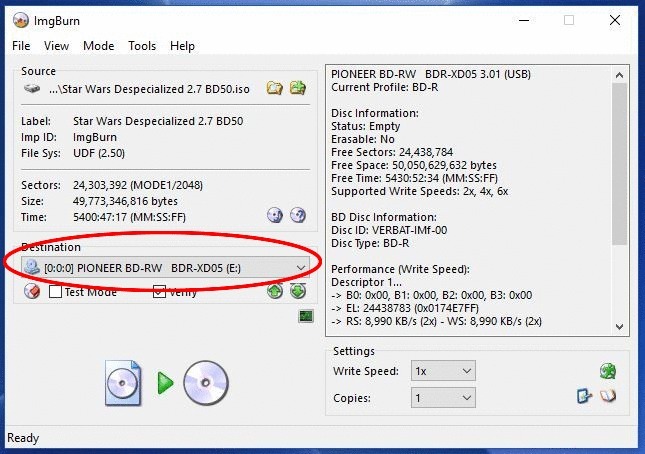 If you have downloaded the version with ten ISOs, you will simply need ten BD-R 25GB discs. 12) Obtain a blu-ray burner drive. 13) Now that you have the necessary ISOs, blu-ray discs, and blu-ray burning drive you’ll need disc burning software. For this, the best method is to use ImgBurn. 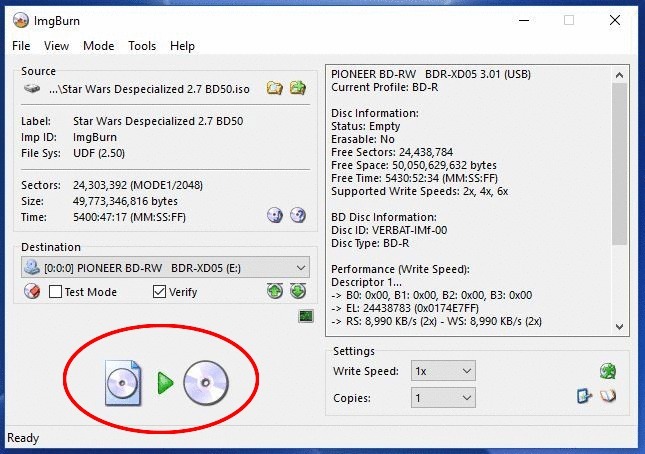 It is a versatile free disc burning program, but the official current version (2.5.8.0) now comes loaded with extra unwanted software. In hopes to help you avoid headaches that might cause, I’m providing a clean link to ImgBurn 2.5.8.0 here: goo.gl/dSPTGG. ImgBurn doesn’t have a Mac version, so if you use a Mac, this list of ISO burners may be helpful. I have heard good things about Roxio Toast and one that is not on that list: ISO Burn Plus. Neither RT or ISO BP is free though, and since I don’t use Macs myself, and can’t speak from personal experience, I won’t be providing direct links to those programs. If you have a Mac, I’m sorry I cannot be more helpful, but I can say with confidence that ISO burning is possible with one, and that the steps should be similar to the steps for ImgBurn pictured below. 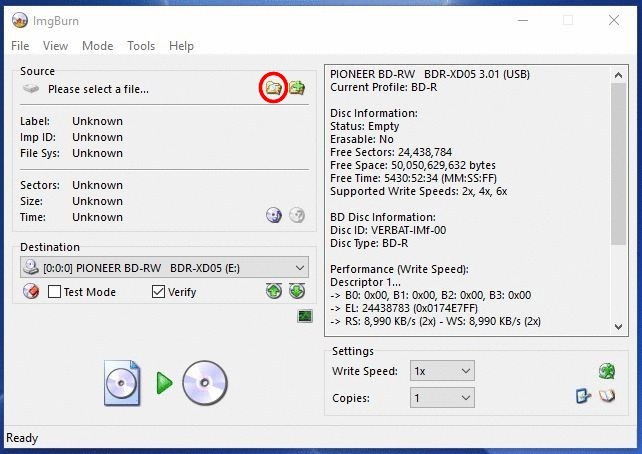 14) Connect your drive and load the blank disc. 15) You’re ready burn the ISOs to your blu-ray! Follow the steps below. 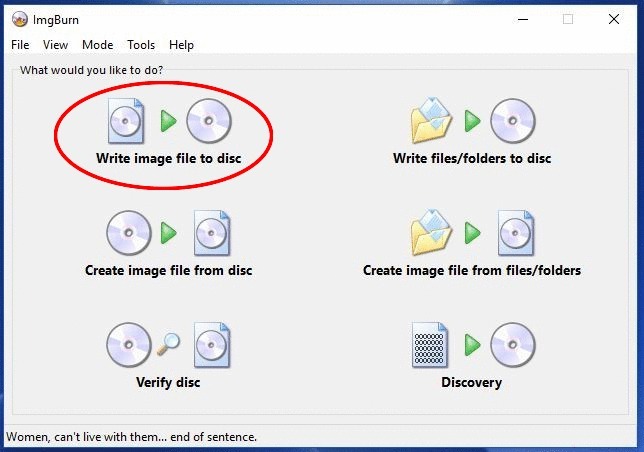 Open ImgBurn and select “Write image file to disc”. Next, Under “Source” use The “Browse for a file…” button to navigate to the ISO you want to burn and select it. Under “Destination”, select the blu-ray drive that you will be using to burn the disc. Make sure the box next to “Test Mode” is unchecked. 5)* This step is optional, but I strongly recommend it. 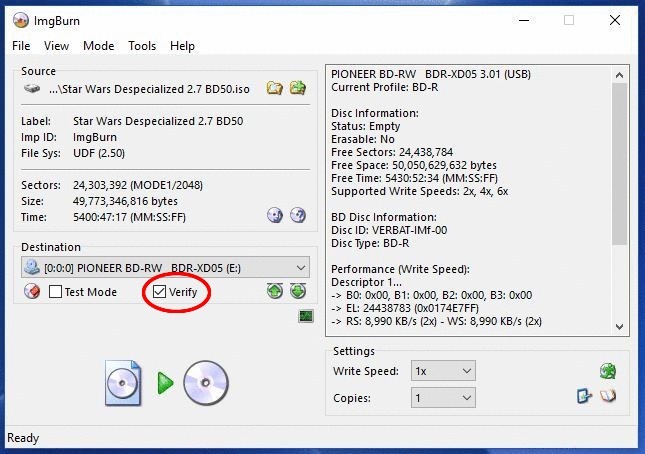 Set the “Write Speed” to the lowest possible setting. This will mean the initial burn will probably take over an hour, but reducing the burn speed means reducing the chances of burning errors. 6)* This step is also optional, but I recommend it as well. Make sure the box next to “Verify” is checked. This will cause the system to scan the disc for errors after the burn is complete. This will add another hour or so onto processing time, but it is a double check so you can be sure the disc has burned properly without any errors. Click the “Write” button to begin the burning process. This is normal. 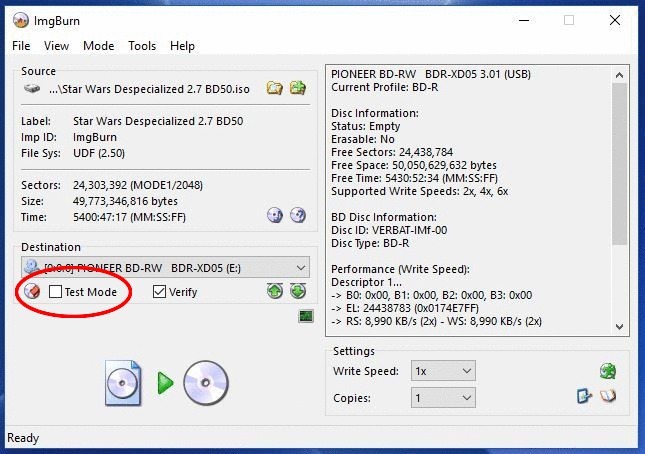 Reload the disc again manually, then click “OK” as the prompt directs. ImgBurn will scan your disc for errors, probably taking about an hour. When it finds none, it will eject the disc again, announce that the burn has been successful, and you’re done! The NJVC Custom Bluray Set of Harmy’s Despecialized Editions is available on Mega. Great work Solkap! Awesome to see these available again and with a great guide to boot. I’ve already got my copies but it’s good to know other SW fans will be able to again get and appreciate these amazing creations and enjoy the SW they remember and love so dearly in a way that should have always been possible. Fingers crossed it doesn’t escalate the copies being sold for profit but I guess NJVC has had a good think about and decided to release them again anyway which is a big decision seeing as how the whole situation must make them feel. Hopefully by making these easy to get (like 2 seconds of google searching), it should actually head of the need of anyone buying them on eBay and instead invest a smaller part of that money if need be in official SW copies instead to meet the requested requirements of owning the movies to acquire these blurays. Note that I found searching for “star wars despecialized blu ray” returned NJVC’s original thread as the first result so it might be good to ask him to include a link for this thread at the top of his OP, as you know that for many people even reading past two lines of text is too much which will then see them go looking for the still easier method of obtaining these if they have cash to spare. A great gesture and some quality work in putting up that superb guide on how to acquire njvc’s Custom Blu Ray Set of Harmy’s Despecialized Editions - and also on how burn them to disc too. Yep, I know. I got mine from you back in July! I’ve been wanting to set up something like this since then. But I also wanted to get a green light from leading users of this site first. Once I got approval from NJVC and Harmy, I posted as quickly as I could. Thank you oojason! Glad to help contribute in any way I can! This doesn’t work with Jdownloader or unarchiver. Not sure where I went wrong. What’s failing to extract? The list or the large rar files? And have you tried using WinRAR? I find it can complete the extraction task error free when some others glitch in the process. It’s as good as free too. Even after your 40 day trial is up, the only thing that happens is a pop-up window that looks like this. All you have to do is click “Close” and you can keep using it with full functionality. Let me know if that does the trick! Great news! I got the OK from NJVC to share his sets on mega again! Harmy has given his approval as well. Go to this thread for more information on and previews of the sets themselves. Also you are required to own an own official copies of the Blu-rays or IV-VI of the HD Digital Downloads. These requirements are to allay concerns of piracy, which could threaten the entire Despecilaized Project. So before you download anything here please obtain official copies of the Original Trilogy in HD. And please … please … DO NOT BUY OR SELL THESE! I also have a guide to burning these sets posted here below in the most comprehensive a way as I could think of. Mods, if you spot something there that I could improve, please let me know. 1) Go to https://www.proboards.com/register and set up an account. 2) Now go to http://swesbrotjbrmls.freeforums.net/ and log in with your new credentials. 4) Click the “NJVC” Subject. This will contain a download link that says “rars”. 5) That link will download a password protected rar file called “NJVC OOT BR MLs”. The page may tell you that there is an error with the preview, but this didn’t interfere with anything when I tested it. 6) Download and extract the file with the password “Speci@lEditionsAre2ShortSighted”. The extracted package will contain a single text file Called “NJVC OOT BR MLs”. 7) This text file will contain links to mega folders for each disc as well as lists of the links you will need for all the individual rar files. The folder links are only provided in case you would like to import them to your own mega.nz account before downloading. It’s probably not feasible to download the entire folder all at once. All these links are in free accounts, which have a 5 Gig transfer limit. That means you’ll probably only be able to download a maximum of 10 files before getting a window telling you to wait several hours before continuing to download. Also keep in mind there may be a “rush” on these files once I post this, so if you run into bandwidth caps because of that, there isn’t anything I can do. 8) For this reason, I recommend using the download manager “FreeRapid Downloader”. It will let you download several files at once, as well as saving your progress if the process is aborted midway through with the wait message. You can get that here. But you will still likely be limited to 10 files every six hours or so. Remember, patience is key. 9) Once you have all the rar files downloaded, extract them with your chosen unarchiving software. 11) For the Star Wars and Empire Strikes Back Documentary Discs a 25 gigabyte blu-ray will suffice. For all the others, you will need dual layer 50 gigabyte blu-rays. I recommend Verbatim Brand discs, as they are some of most reliable I’ve used and least likely to end up as coasters. 13) Now that you have the necessary ISOs, blu-ray discs, and blu-ray burning drive you’ll need disc burning software. For this, the best method is to use ImgBurn. 5)* This step is optional, but I strongly recommend it. Set the “Write Speed” to “1x”, the lowest possible setting. This will mean the initial burn will probably take over an hour, but reducing the burn speed means reducing the chances of burning errors. Mate, you didn’t really need to quote the whole post by solkap to respond with your post - please remove the quoted section. The entire thing won’t extract, but I will use the winrar. I use a Mac book pro btw. Are you missing any files? Are you opening the first file or one of the other ones? Thanks for this. Empire BD50 part 16 is no longer available. The others appear to still be up though. Use the folder link. Part 16 should be available there. Yep, was just checking the files and caught this. The folder link for Return of The Jedi Docs Folder is glitching too. Let me see what I can do. OK, I’ve corrected the error. I guess something must have gotten mixed up in the copying and pasting, because the links in the text file were incorrect. But I have fixed it in the posted text file. Re-download and extract it, using the same information from above, for the updated file with the correct links. WOW! Simply amazing! THANKYOUTHANKYOUTHANKYOU! I’m downloading them right now! I’m glad I still held onto my 50gb blu ray. I thought they would be of no use to me until now. I haven’t gotten a chance to try again but will do. You sir are a god amongst men, no more MySpleen, no invites, now new members can get this. Amazing work! I have tried multiple times but to no avail. The Unarchiver says that the file is unusable every time. Hmmm. Did you run into any trouble like this when you obtained (assuming you did) any of the other versions of the DE? As long as you have all the files in one folder, and go to extract the first file of the set, it should work. Could you post some more info on exactly what steps you are taking as well as the exact text of the error message you’re getting? Also, to other members, I know next to nothing about using Mac books. Are there any users here proficient with Mac OS who might know of troubleshooting steps that I might be overlooking? LordZerome1080 could use your help. The exact specifics are that jdownloader refuses to complete the downloads and the unarchiver says the files are either incomplete and cannot be extracted. Well, if the downloads can’t be completed, of course they won’t extract. So it’s not an unarchiver issue, it’s a download issue. Can you give us more specifics on the problems with jdownloader? Are you hitting Mega’s daily 5gb limit for free users? I don’t use Mega often and don’t have a Mac anymore, but the more information you can provide the better we can help you. Just saying “It’s not working” isn’t going to get us anywhere, as there’s about a million reasons it could be failing. More info helps narrow it down. Which parts have completed downloading? Which parts haven’t and what kind of message are you being given about the parts that are incomplete? Are they showing as still downloading, are they showing as completed but corrupted, are they showing as stalled…?